Only one berth for the 7DAYS EuroCup Quarterfinals remains open heading into the final round of the Top 16. Through five rounds of Top 16 play, several teams have stood out on both ends of the floor in terms of points per possession. Most of them will be moving on to the Top 16, but that is not the case for all of them. Through 5 Rounds of Top 16 play, four teams have scored more than 1.00 points per possession offensively. They are listed in order of efficiency in the table above. 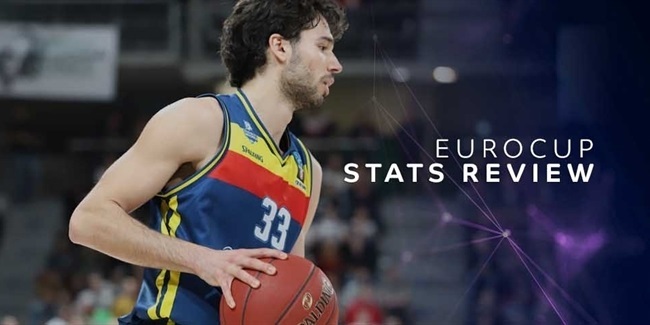 UNICS has not just been the Top 16's most efficient team, but has also distanced itself from the rest of the field with its performance on both ends of the floor on paper. The team's efficiency margin sits at 0.19 points per possession, nearly double that of the next highest team. That's fascinating when you consider that UNICS is in second place in Group H. It is not difficult to see what has made UNICS so successful. Its players have shot the ball at an extremely high level, connecting on an astonishing 46% of their shots from beyond the arc – a huge jump from the 37% they shot during the regular season. Much of their improvement has come in transition, where they've been tremendous in recent weeks. Jamar Smith, Melvin Ejim and Evgeny Kolesnikov have all come up big for the club from behind the arc to propel their recent success. 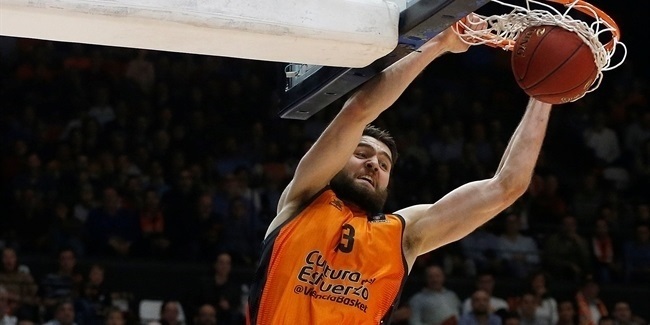 Valencia Basket narrowly missed the top spot on this list. Valencia's players may not make the same volume of shots as UNICS, but their low turnover rate stands out. Each of their frontcourt contributors has seen a steep decline in his turnover rate since the regular season. Bojan Dubljevic, Will Thomas, Mike Tobey, and Aaron Doornekamp are all doing a better job taking care of the ball, helping to compensate for their team's slight decline in shot making during the Top 16. MoraBanc Andorra faces a major challenge on the road at UNICS in Round 6. One of three undefeated teams in the Top 16 to this point, the Andorran club has performed above expectations, with players like Dylan Ennis, David Walker, and John Shurna all stepping up after Andrew Albicy set the tone in Rounds 1 and 2. Despite what they have achieved to this point, the real test remains when they visit UNICS on February 6. 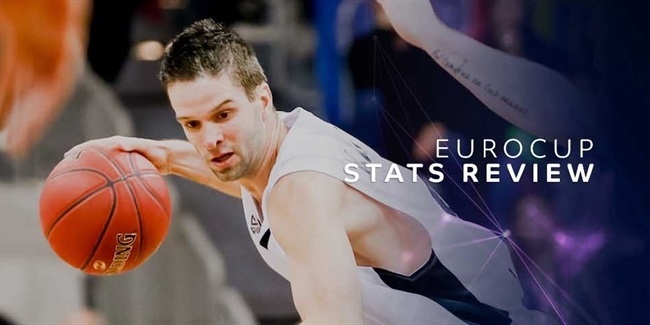 Ulm faces a steep test against undefeated LDLC ASVEL Villeurbanne in Round 6, but even if it manages to win, the German team's fate has already been sealed. Although its offense ranks as the Top 16's fourth most efficient, Ulm's defense ranks ninth, something the team was not able to overcome in a group featuring two elite defensive units. Regardless of its elimination, Ulm showed marked offensive improvement in the Top 16 from the regular season with Patrick Miller playing his best basketball of the competition to drive the team's more potent ball-screen offense. Through the Top 16's first five rounds, four teams have allowed under 0.90 points per possession defensively. They are listed in order of efficiency in the table above. LDLC ASVEL Villeurbanne has stifled opponents in the Top 16. Its players have been especially effective defending other teams' ball-screen actions, thereby limiting the one action that nearly every team in the Top 16 relies on in a pinch. AS Monaco has depended heavily on defense all season and that does not figure to change in its do-or-die Round 6 matchup with Rytas Vilnius. Monaco's defenders have done an excellent job all season of contesting shots without fouling, but the Top 16 addition of Eric Buckner has added a new dimension to an already stout defense, giving the team a legitimate shot-blocking presence that it had done without in the regular season. UNICS Kazan is the only team in the Top 16 to rank among the top four teams in both offensive and defensive efficiency. The Russian team has actually struggled to get stops in transition through five rounds, but have been so effective forcing turnovers and closing out shooters in the half court that it has not hurt its overall efficiency. Lokomotiv Kuban Krasnodar rounds out the top four and currently hold the second-highest efficiency differential in the Top 16 heading into Round 6. Lokomotiv has made subtle improvements across the board from the regular season, and continues to benefit from the presence of some of the competition's longest, most intimidating interior defenders.